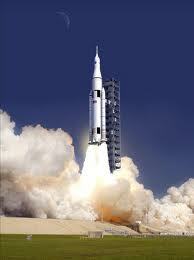 NASA has officially announced the design of their new advanced heavy-lift launch vehicle or SLS. With artwork depicting a vehicle that conjures up memories of the Saturn V and the moon program of 40 years ago, NASA described a rocket that "will give the nation a safe, affordable and sustainable means of reaching beyond our current limits and opening up new discoveries from the unique vantage point of space." The SLS will consist of liquid oxygen / liquid hydrogen burning first and second stages with strap-on booster for added thrust at lift off. The first stage will use the same RS-25 engine as the Space Shuttle, while the second stage will use the J2X engine, upgraded from the Saturn V program. The first versions of the rocket will use five segment versions of the Space Shuttle SRB's. The initial version will be able to lift 70 metric tons into orbit. Later versions will increase this to 130 or more metric tons.